Zero starting speed and extended parallel medical handrails make the L7 Rehabilitation Treadmill ideal for rehabilitation, physical therapy, and sports conditioning. The L7 can also be equipped with a reversing belt and orthopedic suspension system. The L7 surface is 20” x 58” and has a 400-pound user weight capacity. Offering the world’s most versatile solutions for rehabilitative, medical, and sports conditioning therapy. These great options give practitioners more flexibility and control, and give users a more enjoyable experience. 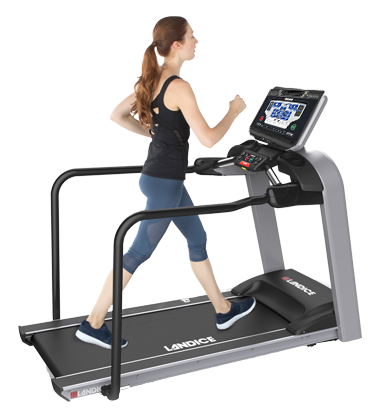 The Landice L7 Rehabilitation Treadmill's commercial-grade construction is quality-crafted for ultimate durability. Landice products are available exclusively through leading fitness exercise and training equipment retailers.